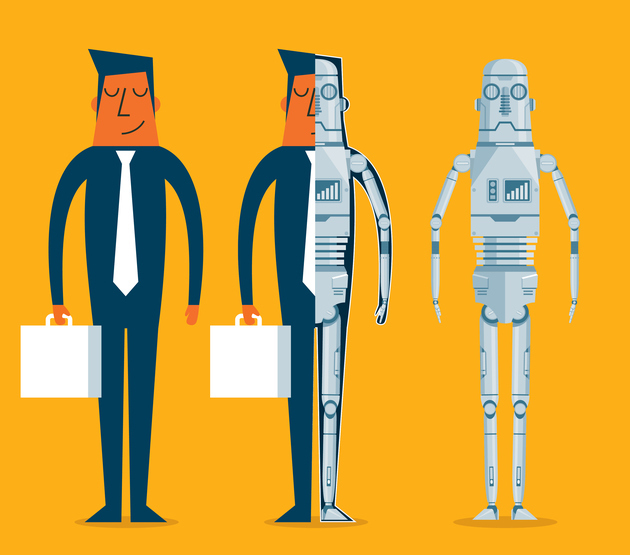 Robotic process automation emerges from the back office to take on core finance tasks. In a few years, robotic process automation may very well merge with or be rendered moot by artificial intelligence. But for now RPA, as it is known, commands the attention of enterprises and their finance teams to a degree few relatively new technologies have. Management consulting firm McKinsey says that more than 80% of companies it has spoken with are experimenting with, implementing, or broadly scaling the technology. And the activity is not confined to large companies — businesses across the size spectrum are piloting this flexible, promising software, according to Brandy Smith, of McKinsey’s automation-at-scale practice. As has been true since RPA’s birth a few years ago, it’s most commonly found in the back office, automating workflows like procure-to-pay, order-to-cash, and record-to-report. The common link among such processes and others suited to RPA: they are business-rules-based, non-subjective, repetitive tasks. Effective implementation can result in greater efficiency and productivity, fewer errors, and higher workforce productivity. But now robotic software appears ready to move to a more visible position in the enterprise: companies are increasingly applying it to core finance processes. Based on a survey of 64 corporate controllers at companies with greater than $1 billion in revenue, as well as other quantitative and qualitative research, Gartner found that 50% of controllers and their teams are either in the process of implementing RPA (31%) or are in what it calls “operational” mode (19%). And within just two years, Gartner expects 88% of such controllership functions to be in one of those two buckets. Many companies, concerned about financial-reporting risk, had paused before expanding their use of RPA to core finance from shared services, notes Johanna Robinson, a finance practice leader at Gartner. But now that the technology has amply demonstrated its reliability, the move to core applications is in full swing. Use of RPA now runs the gamut in finance, automating aspects of financial closing and consolidation; account, bank, and inter-company reconciliations; general-entry posting; cash-flow statement preparation; fixed-asset accounting; inventory accounting; and tax reporting, among other applications. “If you’re not investing in RPA for core finance functions, you’re missing a lot of opportunities,” Robinson says. And, ultimately, as AI becomes more available, mainstream, and useful, enterprises that haven’t built the requisite automation skills and knowledge will be that much farther behind the curve, she adds. As an example of the efficiencies to be gained from just error reduction, Gartner estimates that 70% of the accounting rework performed to fix errors before a financial close is necessarily manual. The rest of the rework is avoidable using automation. For an accounting team with the equivalent of 40 full-time employees at an average annual salary of $75,000, that would amount to about 25,000 hours and $900,000 wasted on work that could be automated, Robinson estimates. “Our conversations with CFOs suggest that the real numbers could be twice that much,” she adds. Enterprises may expect to pay a lot for such savings. But developing bots is generally inexpensive. “The cost of building them is much lower than what I’m used to from a technology-investment standpoint,” says Deanna Strable, CFO of Principal Financial. Gaining knowledge about RPA programming, maintenance, and tracking—as a needed first step toward taking full advantage of intelligent automation—is a priority for the finance team at KPMG. The Big Four accounting and professional services firm is about 55% of the way toward achieving an initial goal of creating 200,000 hours of workforce capacity savings. And the importance of that mission is not something that CFO David Turner plans to let his charges overlook. How can organizations optimize the use of RPA? Gartner’s Robinson offers some key thoughts. First, to gauge the cost and productivity impact, organizations need to focus on hours of work displaced, rather than the number of bots or variety of processes automated. A caveat there is that while today’s bots can be programmed to execute multiple processes, a single bot can handle only one task at a time. That requires careful scheduling of the bot’s time to ensure that the more important tasks are completed first. Second, although standardizing processes before automating them is ingrained in finance professionals and works for ERP and other big enterprise technologies, “with RPA you can standardize as you automate,” Robinson says. Change happens naturally, she adds. Coding the bots involves a logical set of “if-then” steps for replicating very granular actions. While going through the steps, the programmer likely will find some places to improve the logic and skip steps that humans usually take. Third, with RPA there is no need to automate a process from end to end. Organizations can pick individual steps to automate. “That’s very different from the traditional finance mindset, where you’re always thinking about end-to-end,” says Robinson. In fact, today’s RPA tools aren’t actually able to fully automate most end-to-end finance processes — even procure-to-pay, order-to-cash, and record-to-report, says Weston Jones, Ernst & Young’s global leader for intelligent automation. 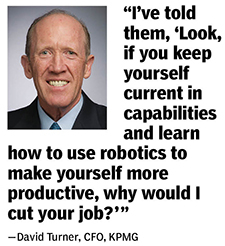 The ability to program bots for a plethora of small tasks and run them on desktop computers poses a risk for companies, especially multinationals, Jones notes. That’s because bots break. Any time an update is made to any software that a bot interacts with, or to a web page that incorporates bot-controlled processes, the bot will typically cease to function until its code is reworked. “Common things like Adobe Acrobat and Microsoft Word are always updating,” Jones notes. A company that deploys hundreds or thousands of bots across operating units worldwide faces a serious change-management issue. The problem is not insurmountable. A bot that runs on a desktop computer must be individually recoded every time there’s a software change. But if all bots reside on centralized servers, those affected by a particular software update can be recoded all at once. 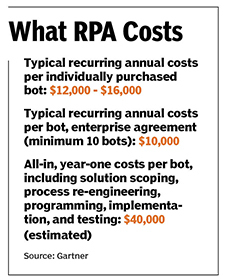 What will RPA look like in a few years? The major vendors are working to enhance their bot-building platforms with the pattern-recognition capabilities that drive machine learning. That would allow bots to get smarter over time, rather than just following their programming. RPA occupies a lower position on a spectrum of what’s generally called intelligent automation. Machine learning is a step up from there, and full-blown artificial intelligence is beyond that. For all the hype over AI, surprisingly few companies are doing anything with AI-enabled technologies except conducting small pilot tests. But some think it won’t be a matter of years but mere months before RPA begins linking up with the more advanced capabilities in ways that will be meaningful to a large swath of companies. “We think that the lines between RPA, machine learning, and AI are going to start to blur within just 12 to 18 months,” says McKinsey’s Smith. According to Gartner, while 56% of companies are evaluating AI for accounting and finance automation, only 5% of them are in the implementation phase. But by 2020, 31% of companies are expected to be in the implementation phase and 26% in “operating” mode. For vendors, those trends could lead to either a war for survival or a softer merging of robotics and AI players, marked by a significant phase of consolidation.